WaterShed UnderDeck Systems transforms the space under your deck into an attractive, usable, living area while adding style, value and a beautiful living area to your home. Underdecking adds a clean look that will brighten the area under your deck. We are the manufacturer of the material many installers use. We custom craft your underdeck in-house to ensure a perfect fit on your site. This saves us time and you money and prevents leaks in the future. We offer a 50 Year Warranty on materials. Guaranteed and Transferable. The product will not flake, rust or peel. This gives you lasting peace of mind. "We are thrilled with our UnderDeck below our deck! Greg was a pleasure to work with. We highly recommend WaterShed Underdeck." "Our underdeck totally changed our outdoor setting from a damp dark place to a wonderful space to entertain and watch the children. Thank you Greg, job well done." WaterShed UnderDeck Systems transforms the ceiling space under your deck into an attractive, usable, living area while adding style, value and a beautiful living area. 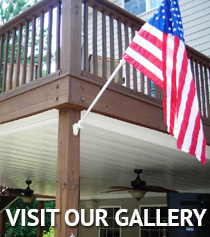 Custom Underdecking adds a clean look that will brighten the area under your deck. With over two decades of experience in building industry we have proven systems for your success. Our proprietary product innovations is manufactured in our facility.